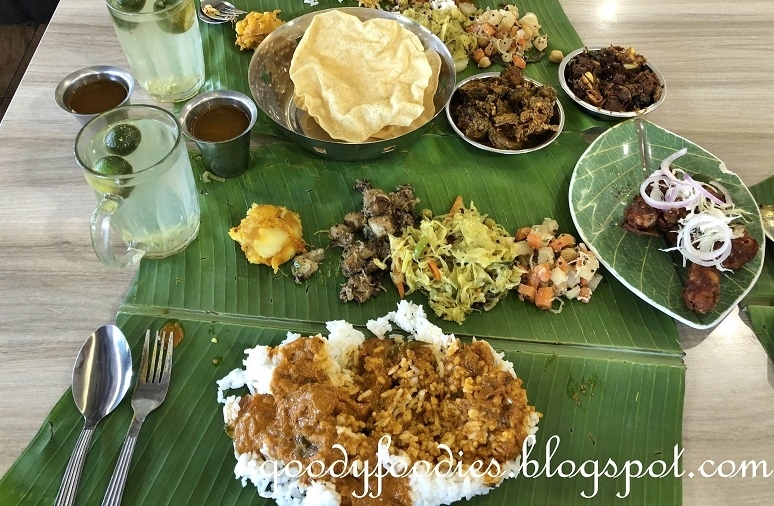 One of the best banana leaf rice places that our #BLRGang came across recently in KL was Bala's Banana Leaf in Bangsar. Taking up a corner lot shop at Taman Lucky Bangsar, the restaurant is spacious, clean and well-ventilated. We placed our order for Banana Leaf Rice (RM8) which came with a choice of either chicken, fish or mutton curry or dhal. The curries were thick and well-spiced. It came with four types of vegetables, most of them were potato-based and I was happy to see my favorite stir fried cabbage. :) Pappadums were nice and crispy, and rasam is also served with your meal. One of our friends took the BLR without the R(ice) (RM6.50) and had it with chapati (RM2.10). We also ordered the fried chicken (RM8.50) which was cooked to order, mutton varuval (RM10.60) as well as crispy, fried bittergourd (RM3). They do daily specials and during our visit it was Chicken Rajasthan (RM10.60), thick chunks of chicken in a rich, fiery gravy. Mutton varuval - tender chunks of meat.. delicious! Service here is friendly and welcoming, and definitely adds to the whole dining experience. Price: Total bill RM62.70 for 3 pax, including drinks.